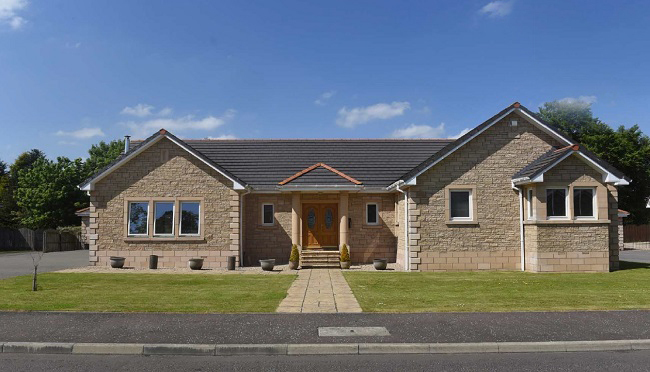 An immaculate modern villa offering handsomely proportioned living accommodation is available in Kinross-shire. 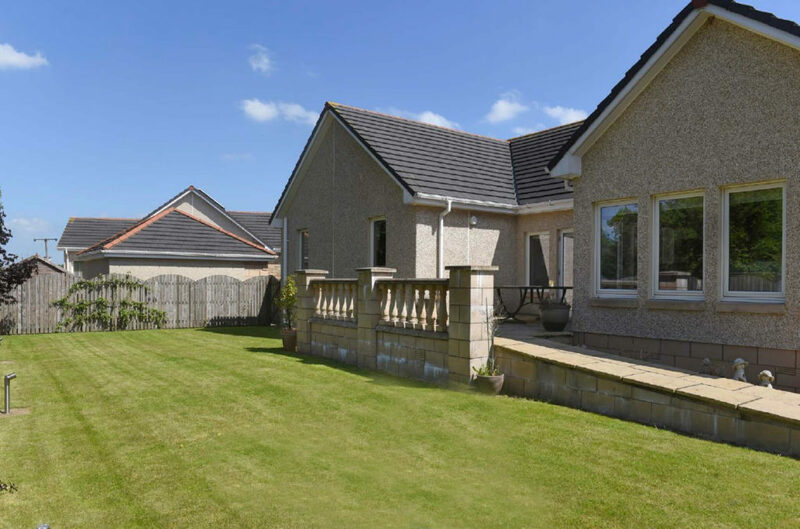 Presented to the market by Rettie in Edinburgh, this home in Kellieside Park, by Milnathort, is set over one floor, and finished to an exacting standard of contemporary specification, with high quality fixtures and fittings. 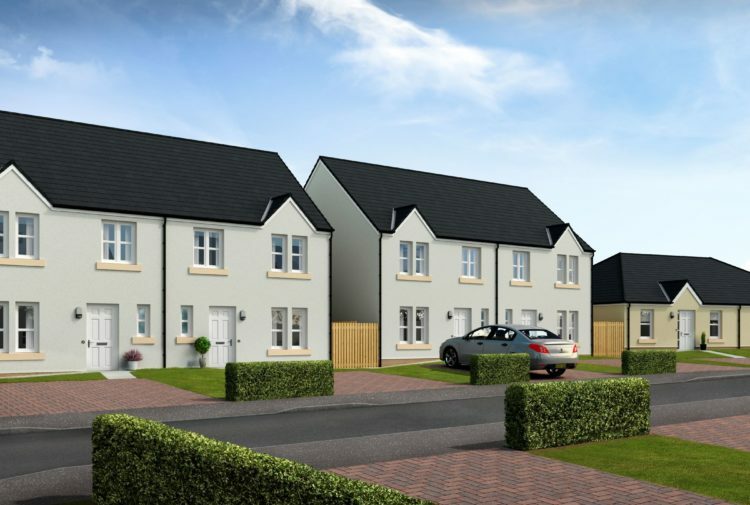 Built by the well-regarded construction firm, Premier Properties, this is a deceptively spacious, modern home, which has been constructed to a high specification. Internally, the pristine accommodation has been finished to a discerning standard of design, in a classic yet contemporary style, which features American oak finishes, downlighting, neutral colour schemes, and high quality sanitary ware. A wealth of modern conveniences, including a sound system with integrated speakers, inside and outdoors, an Aquavision TV and NEFF kitchen appliances, support a most comfortable contemporary lifestyle. The distinguished façade of the house is pointed with sandstone and set back from the residential cul-de-sac, beyond a neat front garden. A flagstone path intersects the lawn, leading towards the front; an attractive formal entrance, with double-doors, which is sheltered by a pillared porch. Beyond the threshold there is an inviting entrance vestibule, with a large cloaks cupboard. A pair of glass-panelled doors lead into the spacious Reception Hall beyond, which functions as the main atrium of the property and incorporates a large formal dining area. Oak flooring extends throughout the expanse, in a swathe of synchronous design and tall ceilings enhance the impression of space. By the dining area, the external elevation is punctuated by a series of windows and a set of French doors to the patio terrace, which cast a wealth of natural light across the expanse. Double doors lead into the sitting room; a generously proportioned reception room which is decorated with handsome cornicing, a ceiling rose and oak flooring. A panoramic wood-burning stove, with a raised hearth is inset into the wall, behind a glass panel, and provides a focal point to the room. There is also a large picture window, with an outlook over the neat front garden. 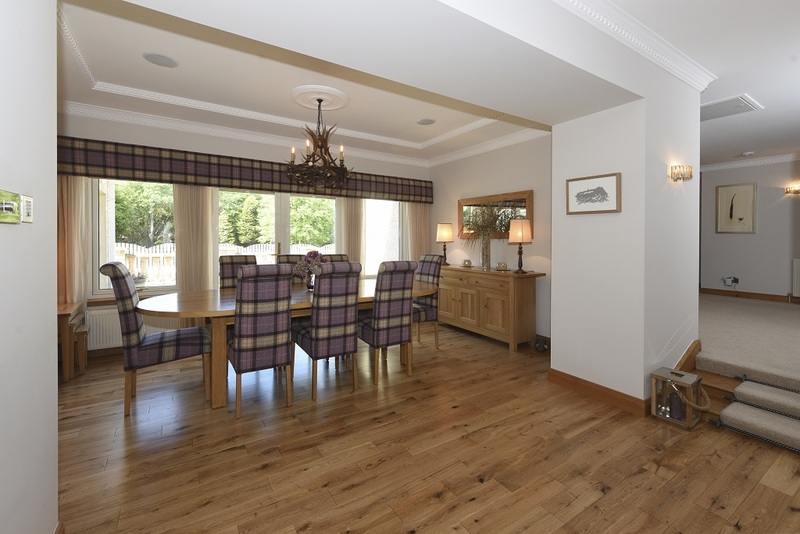 The kitchen/family room is a flexible, free-flowing space, which affords effortless and relaxed living, with ample room for a sociable lounge area. 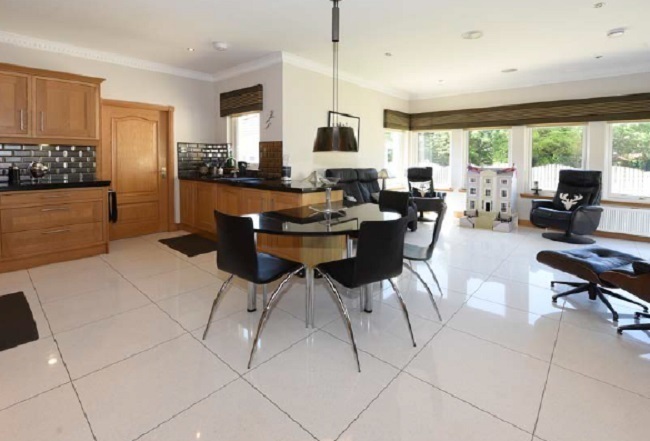 The kitchen itself has been designed to a meticulous specification with an array of contemporary wall and floor units, accented by black granite work surfaces and polished tiled flooring. It offers a high standard of modern convenience, with a generous array of integrated, modern NEFF appliances, including two ovens, a grill and warming drawer, a microwave, a dishwasher and an induction hob beneath a fitted hood with an extractor fan. A sink, with an elegant swan neck mixer tap is inset into the work surface, beneath a window offering a private view over the rear garden. The granite work-surface extends naturally into a split-level breakfast table, allowing for sociable, everyday dining. The living area extends into a bay window, which frames a raised outlook over the garden. From the lounge area a pair of French doors, lead out onto the large, sheltered patio terrace; the ideal spot for alfresco dining when weather permits, which is finished with classic stone balustrades and an integrated speaker. Off the kitchen there is a neatly appointed utility room, with further wall and floor units, finished with a granite countertop, and another sink. There is space for white goods and a deep cupboard which houses the boiler. The room has a useful, exterior door to the rear of the property. From the reception hall, a step leads up to a large, carpeted area, from which each of the bedrooms are accessed. There is a hatch in the ceiling, fitted with a ladder, which provides access into the floored loft. The area, which currently provides a mass of storage, could be easily converted into an additional set of rooms, subject to the necessary consents. The carpeted hallway is of sufficient size to house a staircase and also offers a deep storage cupboard, which houses the hot water tank. The master bedroom en suite is sumptuously proportioned and extravagantly appointed with large, ‘his-and-hers’ dressing rooms, each of which is fitted with wardrobes and has a window, supplying natural light. The en-suite features both a deluxe bath and a separate shower cubicle with deluge head, as well as a WC and ‘his-and-hers’ wash hand basins, set atop a fitted vanity cabinet. The room is finished with tiling to the walls and floor and an Aquavision wall-fitted TV with an integrated speaker. There are two further comfortable double bedrooms, each of which has fitted wardrobes and is accompanied by a contemporary en-suite bathroom, featuring a deluge shower, a WC and a wash hand basin. The accommodation within Kellieside is completed by a study, fitted with shelving and a cloakroom, which are both accessed from the reception hall. The cloakroom is complete with WC, with a contemporary wash hand basin set atop a series of fitted cabinets. Externally, Kellieside Park presides over a neat plot, which incorporates attractive lawn gardens to the front and rear of the house, planted with specimen trees and shrubs. The rear garden is fenced for privacy and predominantly laid to lawn. It features a raised patio terrace, accessed via a flagstone ramp, with handsome balustrades, which is the optimal spot for outdoor entertaining. To one side of the house there is a large monoblock driveway, which terminates at the foot of a large, detached double garage, with electric up-and-over doors. 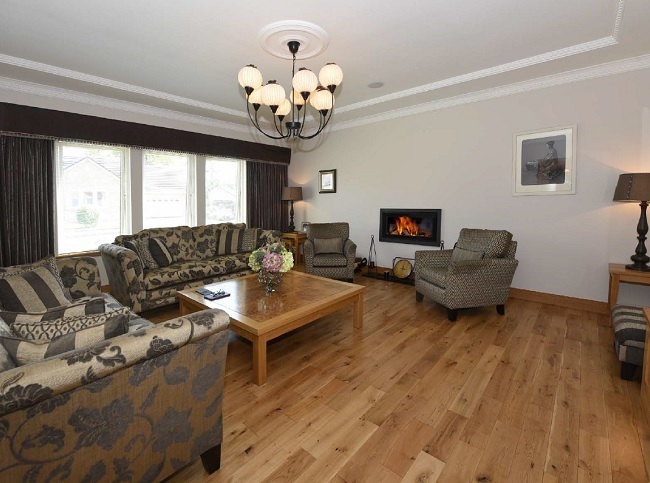 The attractive village of Milnathort, lies approximately 2.5 miles to the east and hosts a good primary school, shops for everyday, local needs, and a number of pubs and restaurants. The strong community also offers bowling, bridge, curling and golf clubs. The county town of Kinross is a mile to the south of Milnathort supports this offering with both primary and well-regarded secondary schooling, a supermarket and an eclectic mix of shops, as well as a leisure centre, a health centre and the usual range of professional and banking services associated with town life. Keen golfers are spoilt for choice by local courses with nearby Kinross offering two excellent 18 hole courses and the Gleneagles Hotel, (host to the Ryder Cup in 2014) approx a 25 minute drive away, and St Andrews about 31 miles away in Fife. There are also a host of local golf courses from Milnathort to Muckhart, Ladybank to Rosemount. 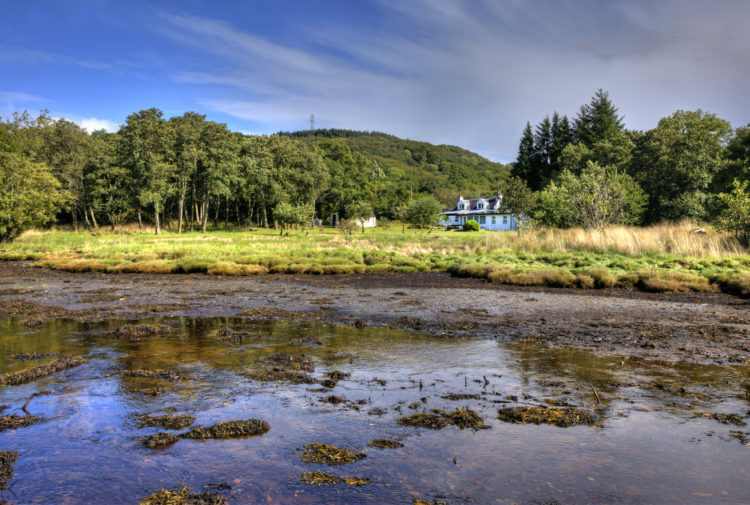 Other country sports are easily found in the local area with trout fishing in Loch Leven and a wide range of footpaths and bridle tracks to explore the surrounding area. 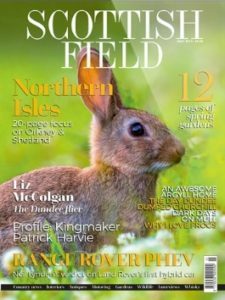 Eventing, polo and race horse trainers are located in Kinross-shire, and Perth Race Course and polo are summer attractions at Scone Palace, Perth. 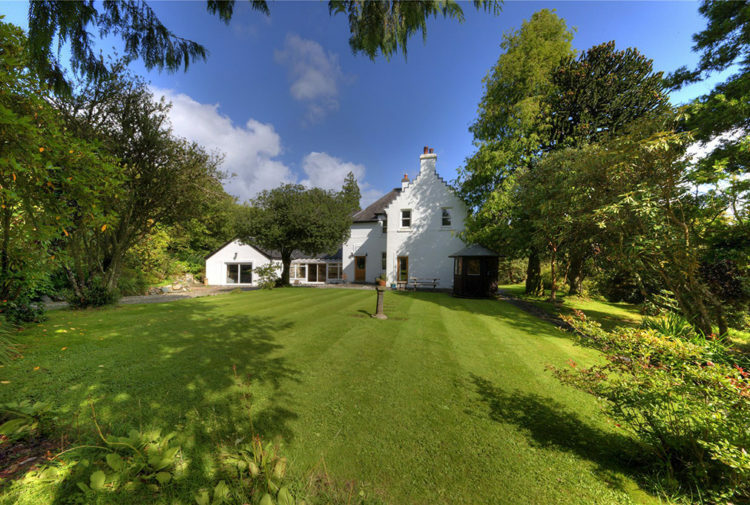 The agents will consider offers over £460,000.